First the dimensions of the Lexmark X4550 when closed but power lead and USB (if used) is plugged in 45x37x16cm. Now with paper stored in the rear vertical position and the output tray lowered these figures become 45x52x38cm that is the actual amount of desk, shelf or floor space it will require. The scanning lid is landscape and items easily inserted whilst it is still far lower than the height required for A4 paper in the input storage tray. This is a 'home' product as opposed to 'office' as it is reasonably priced. It is a four ink two cartridge offering. It is predominately cream in colour. The front has all the controls. A total of 14 buttons around a small 5.5x1.5cm LCD display all clearly labelled and this central area is tilted up at 45 degrees making it easy to read at most angles. On the right front edge are two card slots the first for SD, MMC, XD and MS. The second for compact Flash and Micro Drives. There is also a Pict Bridge slot. If you insert a card in the card slots then you can either decide what to print via software on the PC or print a thumbnail sheet of images and make your direct printing choices from that. As a printer I was pleasantly surprised at the 'draft' mode quality it was quite black some draft modes are only grey. It was not that rapid and a little noisy, I got 14ppm when printing the nonsensical 200 word document that is the nearest one can get to what is currently used by printer manufacturers. Printing a more normal 1500 word document spread over four pages can in at 12ppm. While this may not be anything like the claimed speeds it was consistent. Printing A4 pages on photo paper takes around six minutes, this can either be a single image or a number of different images on the same page the printing time does not seem to vary. This is of course in best mode as what else would you use when printing photographs on photo paper. I was certainly impressed with the copy mode (this can be used from within Windows via some nice software or) direct without the PC being switched on. I printed an A4 PDF page and then put this on the flatbed to copy. Once this was done around 45seconds later a sheet was produced that was identical. When I returned to them later I could not tell them apart. Yes they had both been printed by the same engine but normally a copy looks a little different. There is of course some OCR software in the package and this worked well providing the original page was not creased or crumpled, however always check any output as even the best OCR package is only 99% accurate. 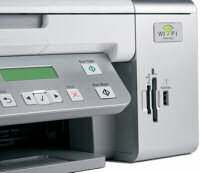 The software installation also covers setting up the unit showing you in images exactly what to do and this includes inserting the ink cartridges etc. Then it moves on to installing the software this section takes around 15 minutes however towards the end the indicator stop moving for around three or four minutes and there is no hard disc activity so you may think there is nothing happening, be patient it will come back to you and it's at this point that you choose if you will use the unit via USB or wireless. 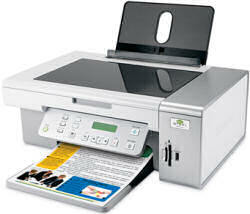 This is a unit that helps the occasional user and while not a rapid printer the quality is okay. Photo printing is slow by modern standards but the output pages are dry. Doing my Internet searches found it at a best price of £58.99 from the first link below.